A blog on the goings on and on going items of interest at The Insurance Library Association of Boston. A non-profit library open to consumers and students interested in insurance and a membership library for those who use us for business purposes. We are sorry for the silence on the blog while we were prepping for last Friday's event. 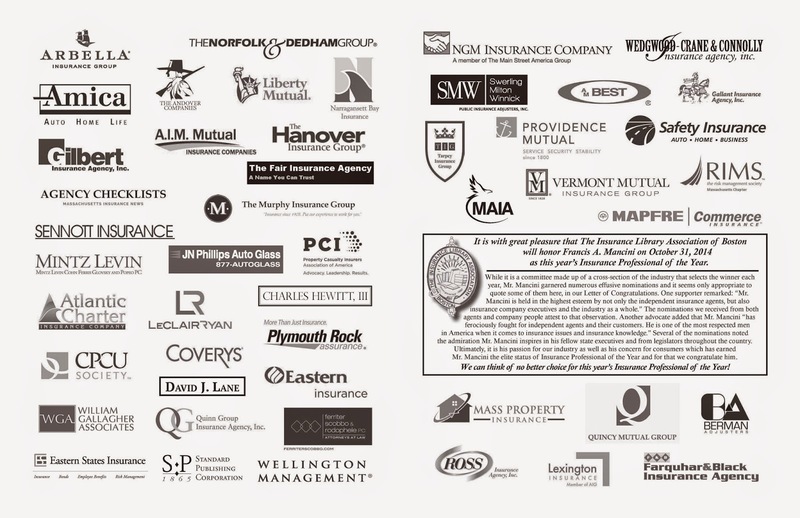 The 13th Annual Insurance Professional of the Year Award ceremony was a success in every sense of the word! We had a record number of attendees (almost 500) to honor this year's winner, Francis A. Mancini. We also had a record number of signers for this year's Letter of Congratulations published in The Standard. We are so proud of what this event represents and how much it has grown in the last 13 years. It is through the support of those in the industry that this event is so successful. We owe a debt of gratitude to each of the organizations and individuals who has sponsored, donated, and attended this event for the past thirteen years. Not to mention to the exemplary professionals who have accepted the award; thank you. Finally, don't miss the interview with Frank Mancini in today's edition of Agency Checklists. As you may have seen in our most recent newsletter (and if you didn't, why aren't you on our email list?! ), Summer hours are now in effect at The Library. Through Labor Day, The Library will be closed on Fridays except by previous appointment. We will periodically check email and voicemail, so if you have a rush request, do leave us a message and we will do our best to help (please note that extra fees may be incurred for the rush request). We use this time to work on projects which we can't get done during the rest of the year and to catch up on various tasks. We believe that taking this time "off" in the summer better prepares us to meet the needs of our patrons throughout the rest of the year. 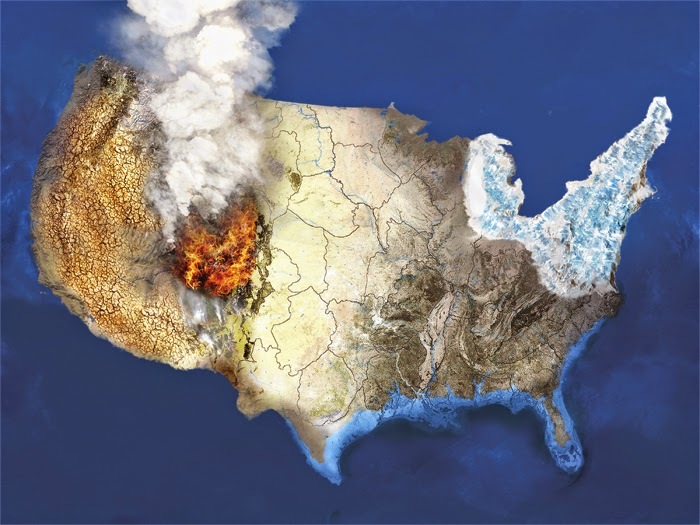 As those of us in states with four seasons are experiencing the highs (and lows) of spring, it seems an apt time for all of the attention which is currently getting paid to climate change and insurance. We have been inundated, of late, here at The Library with information on the topic. In today's mail we received copy of the most recent edition of Risk & Insurance with an arresting image on the front (see above). Risk & Insurance cites a number of studies/facts from leading expert organizations in their three page spread entitled: Business Resiliency in the Face of Climate Change, including from Munich Re and from The Business Continuity Institute. On Friday, The Standard published an article with excerpts from a recent S&P study entitled: "Are Insurers Prepared for the Extreme Weather Climate Change May Bring?" It's been a popular study, also garnering articles, from Property Casualty 360, and two from The Insurance Journal. Last week we received a donation of books from a member company. Included in the donation were copies of At War with the Weather: Managing Large-Scale Risks in a New Era of Catastrophes by Howard C. Kunreuther & Erwann O. Michel-Kerjan, 2009, The Financing of Catastrophe Risk edited by Kenneth A. Froot, 1999, and Catastrophe Modeling: A New Approach to Managing Risk edited by Patricia Grossi and Howard Kunreuther, 2005. If you're interested in the topic, we here at The Library are poised to help, as best we can! What's Black & White and Red All Over?! It's not a zebra with a sunburn, it's articles about us! In case you missed it, in the past week two articles have been written about The Library. Agency Checklists started the week off with an article about The Boston Insurance Training Center arm of our Library. 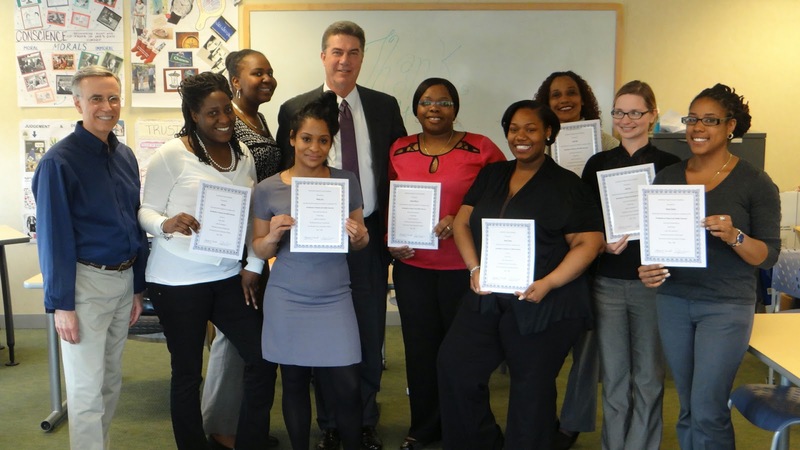 You can click here to read more about our first class offered at Roxbury's Project Hope. The Boston Insurance Training Center was funded by grants from the Arbella Charitable Foundation and Eastern Insurance. This grant allows us to introduce career opportunities to underrepresented individuals and to provide the foundation of quality, professional insurance education. For more information on this program or to offer internship/job opportunities for those taking the classes, please contact Glenn Cryan. We're ending the week with an article in The Standard. 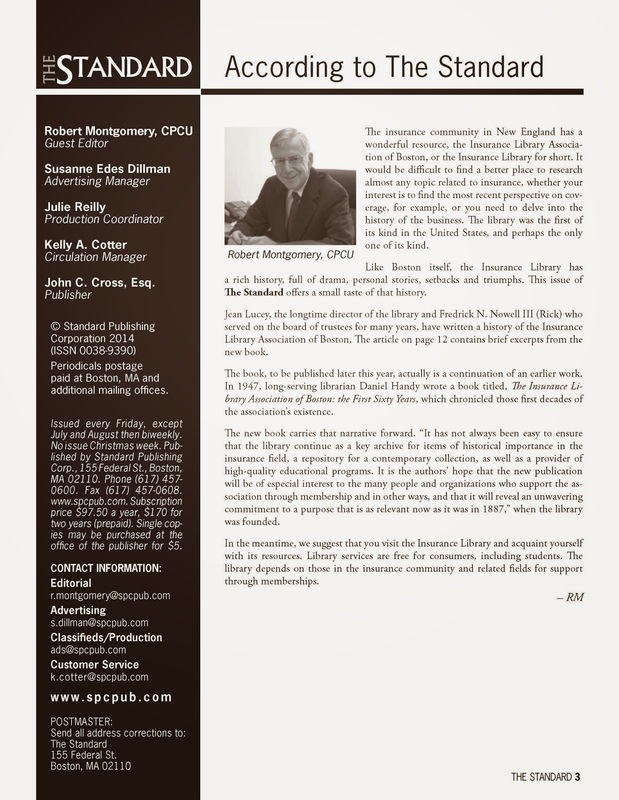 Robert Montgomery, CPCU announces in his editorial that The Library is publishing a History due out later this year. This week's issue of The Standard contains some excerpts from that upcoming book (that article begins on page 12). 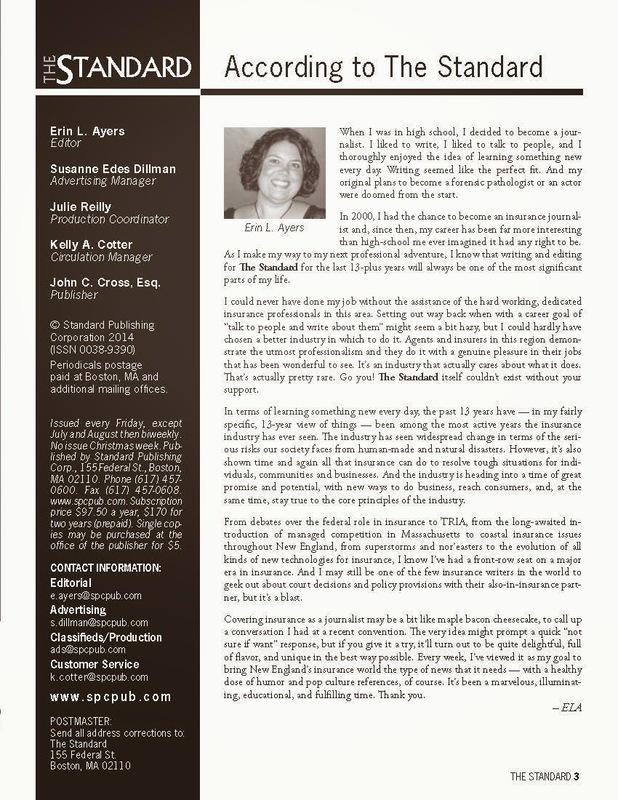 Today, The Library joins many in the New England Industry, in wishing Erin Ayers, long-time, and much loved, editor of The Standard, the very best of luck in her future endeavors. We've always had a soft spot for Erin, here at The Library. Often we'd vie for a spot next to her at our big event because she was easy to talk to and always interesting. Erin was a joy to correspond with, should we need information regarding recent local events or suggestions on where to find a particularly tricky statistic. Erin, we wish you well and we hope you stay in touch! 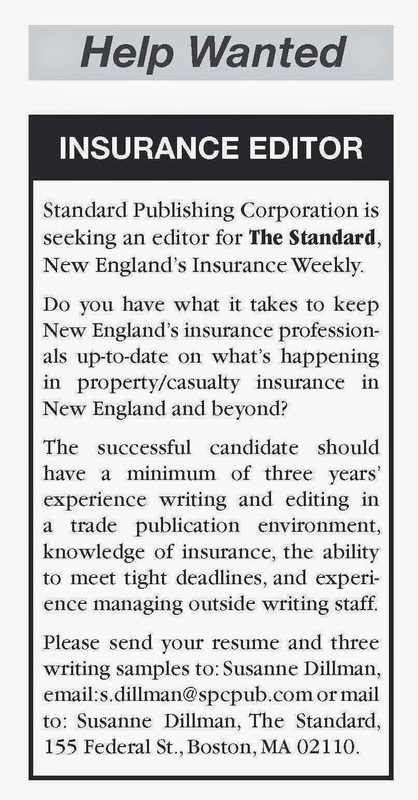 If you're interested in picking up where Erin is leaving off, you can see the job description below. Cyber Insurance -- We're Not Done Harping On It Yet! We just came across a report from Willis entitled: Willis Special Report: 10k Disclosures -- How Retail Companies Describe Their Cyber Liability Exposures. In light of the last article we linked to which described the Target debacle as "the equivalent of 10 free super bowl ads," We thought it might be good to draw your attention to what retailers think about their cyber risk. Cyber Insurance Still a BIG Deal! Insurers have pushed the coverage hard for a while, and this year may be an important turning point. "The Target data breach was the equivalent of 10 free Super Bowl ads," said Randy Maniloff, an insurance-industry lawyer with White & Williams. Looks like this blogpost isn't so out of date after all!